Tuesday was the second-to-last game of the year, and it was a special one. 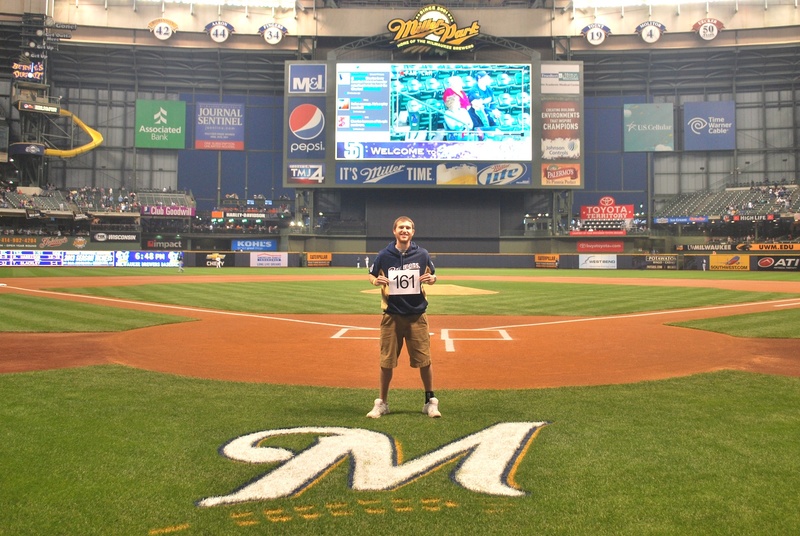 Victoria and I left Madison at 3:30 and made it to Miller Park about 90 minutes later. 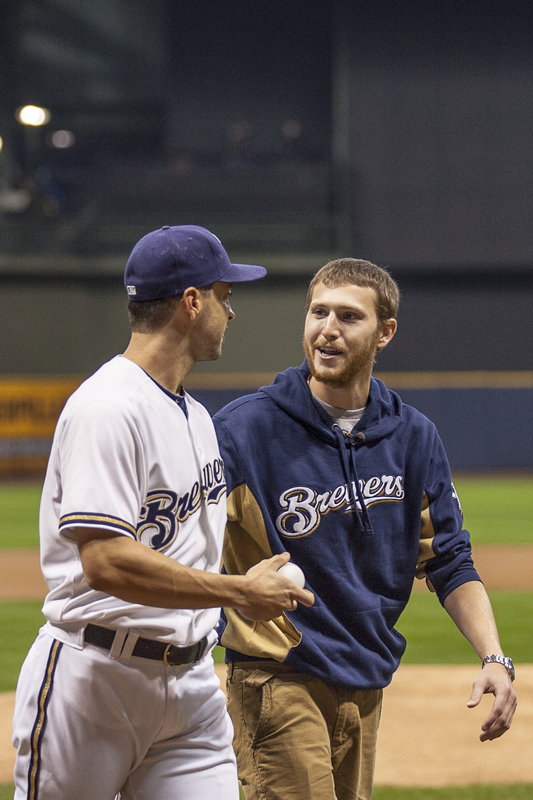 I met up with a friend, Josh, to play catch for a few minutes before heading inside for my first pitch. He was with a group from Fort Atkinson, and they surprised me with a $550 check for Be The Match. Thanks guys!! I probably made about 30-40 throws with Josh (bouncing one). 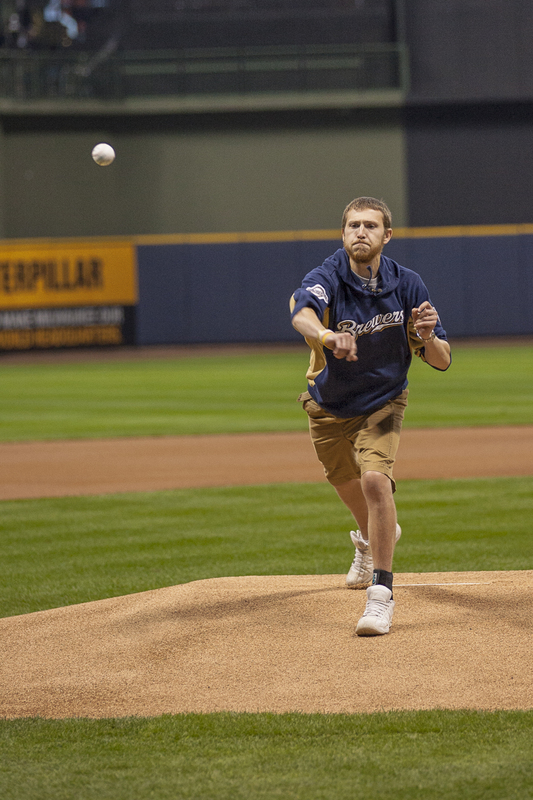 They were kind of all over the place so I wasn’t feeling too confident about my ceremonial first pitch. At 6:50 Drew, who handles the pre-game on-field activities, told me that I’d be up in 10 minutes. 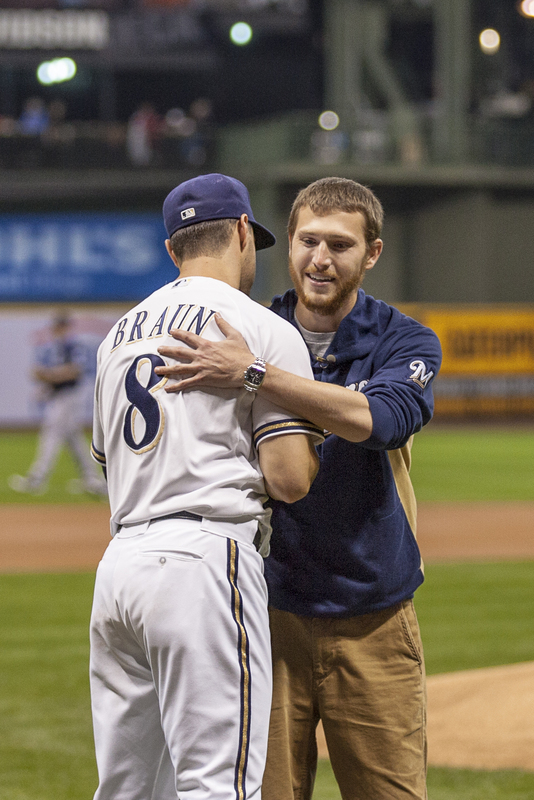 Last week sometime I thought it would be cool if Braun could be my catcher. On Thursday I had sent a text to Ryan’s dad, Joe, asking him if Ryan would be interested in catching for me. He said he’d ask him and on Monday he got back to me Ryan would do the honors. I thought he might forget or something might come up but on Tuesday I saw Braun on the top step of the dugout with his glove in hand. Awesome. As we both left the on deck area he said he wouldn’t have missed this. Double awesome. 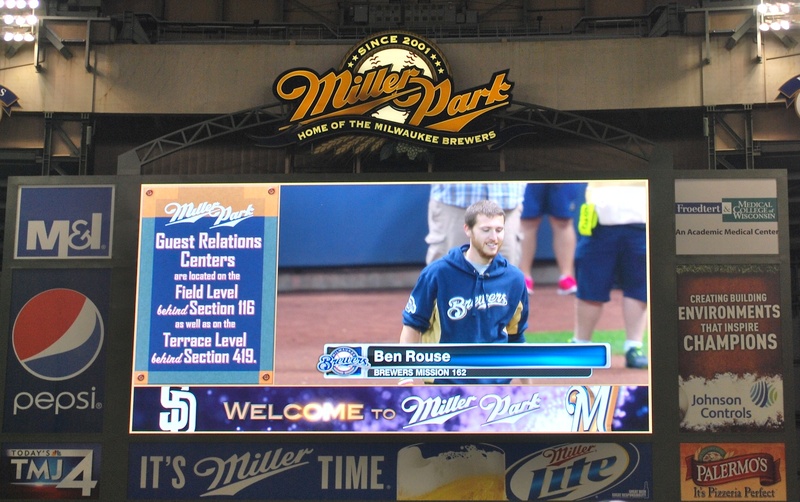 I made my way to the mound and made sure to smile this time. Sara Stathas took the following photos and Kathy forwarded them to me after the game. Thanks Sara & Kathy! I may have smiled going to the mound but I was all business as I let go of the pitch. You’ll have to watch the videos below to see how it went, but I think my smile gives it away. 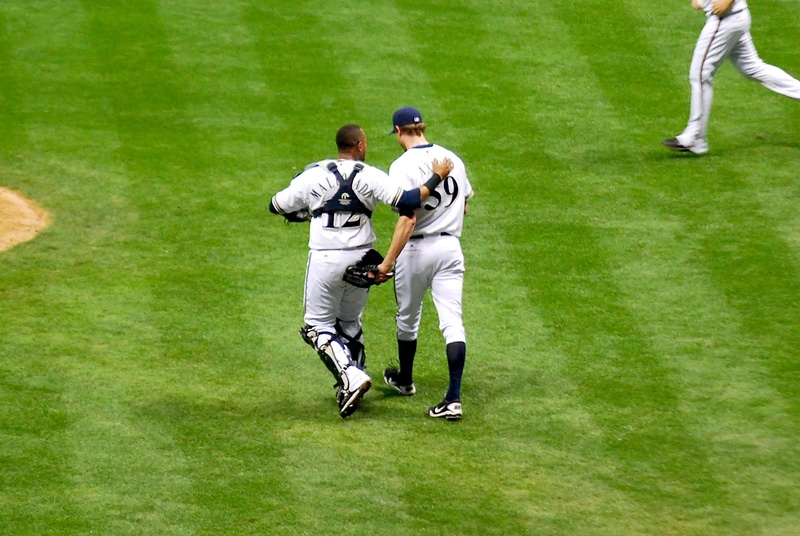 Ryan and I talked briefly as we were coming off the field. He mentioned that his mom (Diane) told him about my run-in with a guard rail on the way to D.C. It was all a blur but I think I mentioned that I can see why he’s such a stand up guy after meeting both his parents and getting to know them a bit. I meant to ask if him and Larisa would want to go on a double date with Victoria and me at some point, but I forgot. If nothing else it would’ve been a good joke. Victoria and I went up to our seats in section 221 after the top of the 1st. In the bottom of the 2nd Travis Ishikawa fouled the 1-1 pitch back in our general direction. It ricocheted off the wire that supports the protective screen and then bounced off a few empty seats and rolled in our row towards Victoria. She was the quickest of the bunch and scooped it up. For future reference I just sat there and watched it unfold. Awwwwww yeeeeaaaaaahhh! Grand Salami. 4-0 Brewers. After the 3rd inning Kathy (who was sitting across the aisle) and Victoria and I walked down to “the point” out in left centerfield. It was there that I did my last interview on FS Wisconsin with Telly Hughes. Brian Anderson dishes out a joking low blow at the end, but it’s all good. After the interview we returned to our seats, stopping to get a Polish sausage along the way, my 99th sausage since Opening Day. The Padres scored a run in the top of the 4th, added another in the 6th inning and still had the bases loaded with only one out. Kameron Loe came in to try and escape the jam and allowed only one inherited runner to touch home plate. Whew! Axford got the save opportunity in the 9th and struck out the first two batters he faced. The next two singled and the Padres had runners on the corners with two outs. 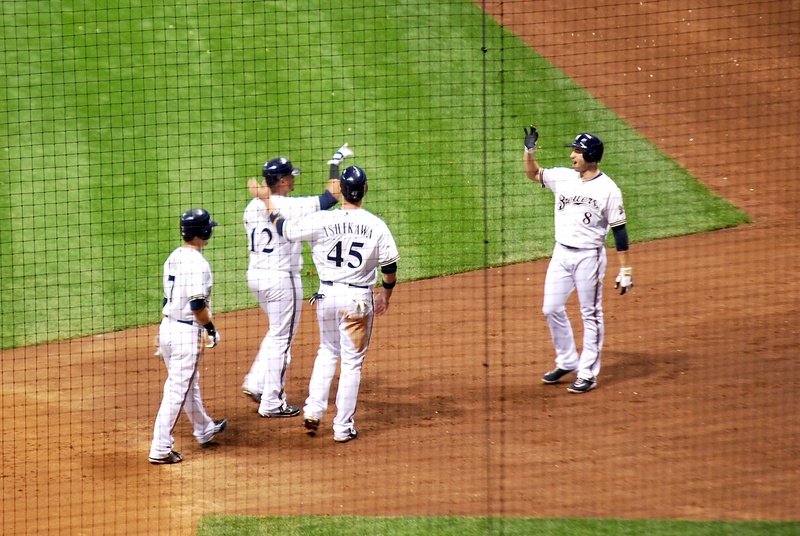 Axford got the job done and induced a game ending groundout to Jean Segura at short and the Brewers held on. Final score: Brewers 4 – Padres 3. 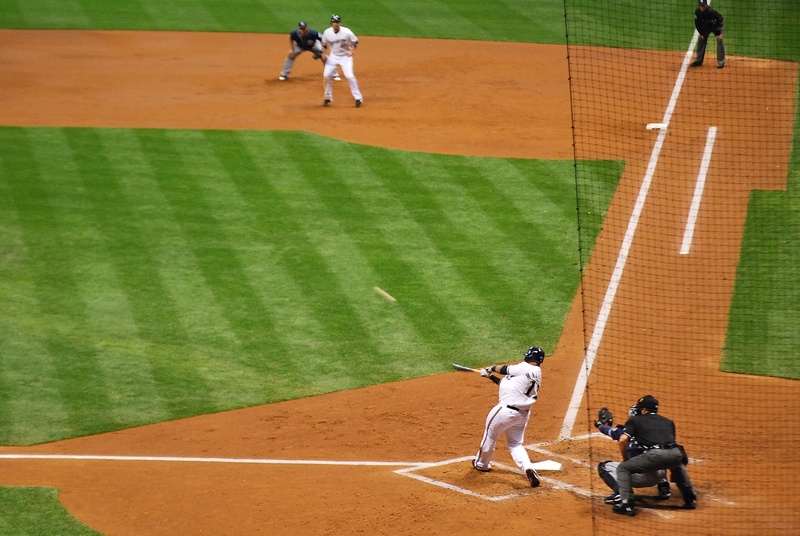 The Brewers struck out 10 batters on Tuesday which means they need 9 as a team to break the MLB record for strikeouts in a season. 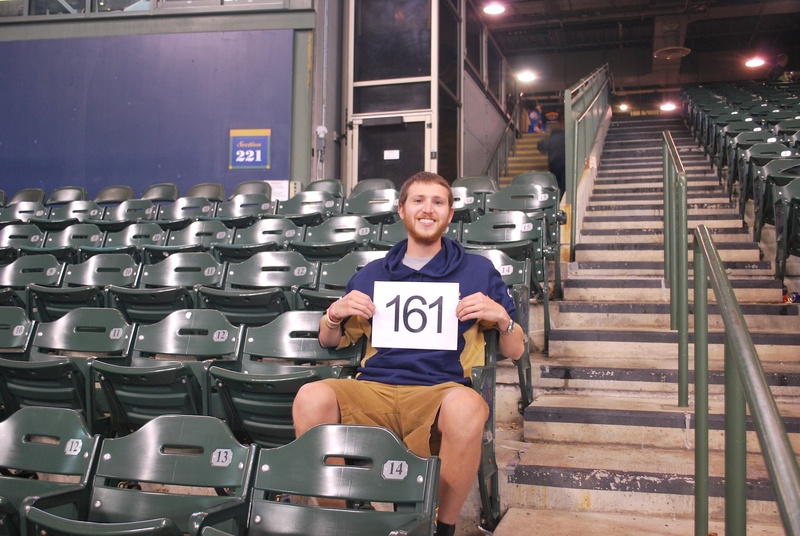 It’s currently held by the 2004 Cubs with 1,404. One per inning is all they need, let’s do it! I didn’t like how far away I was in the game number picture so Victoria and I stuck around for a bit and I had her take one of me in my seat in section 221. Hmmmmm; decisions, decisions. 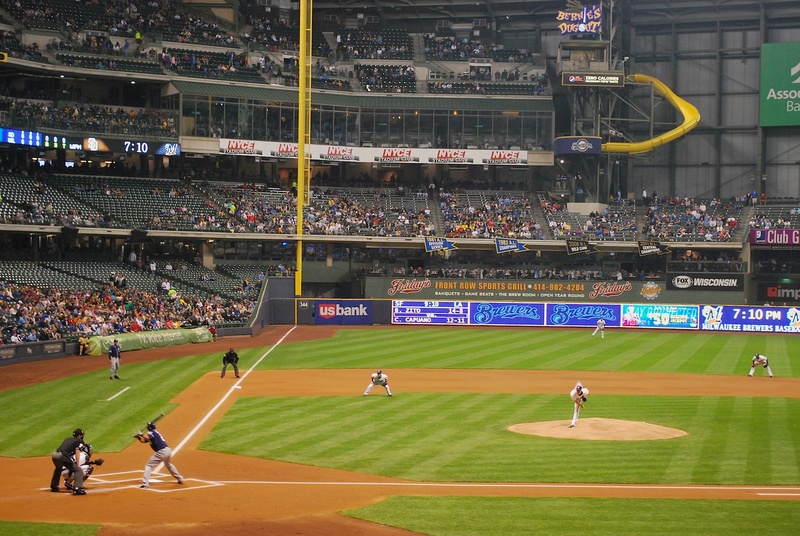 I did an interview with Bill Glauber of the Milwaukee Journal Sentinal and he’ll be meeting with me at Miller Park as well. At 12:30 I’ll be on air with Sports Radio 1250, which is in 15 minutes. Gotta go! Too long for a tweet, but just want to say great job with the pitch. I have some photos, but none better than what you have in your blog. I’m going back down for tonight’s game, but I don’t think our paths will cross (I will be really curious to read tomorrow where your seats are for tonight), so just want to say, from the bottom of my heart, “Have a great life!” You continue to be an inspiration, and I will remember that August 1st afternoon forever. I’m staying over in Delafield tonight because I want to see every last moment of the game, but will be heading back home early in the morning because a wonderful person has offered to pick me up to go “see” President Obama tomorrow. From a great distance, no doubt! I so wanted to do that, have tickets, but the logistics seemed a challenge, so decided to pass. Couldn’t turn down this offer, though. 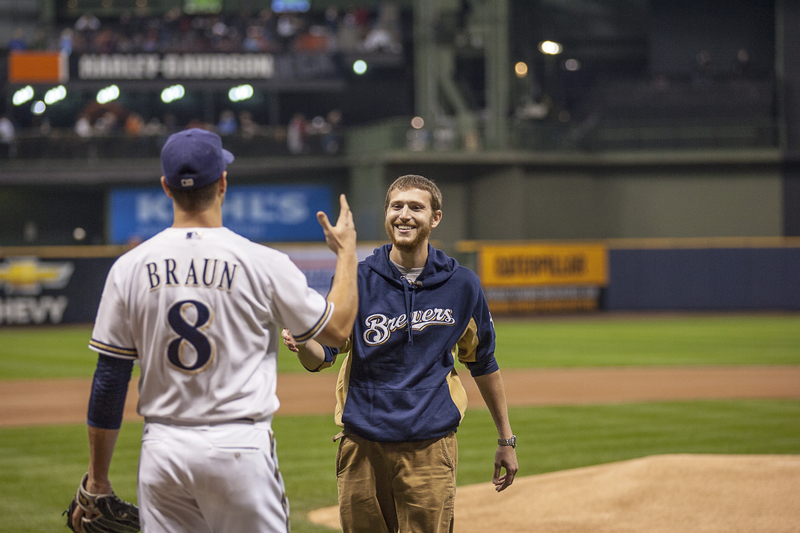 Brewers tonight, the President tomorrow. What could be better?! Best wishes to you and Victoria–and we’ll expect a full report when you double date with Ryan and his lady! Congratulations on your achievement! I feel like there was a local new piece on you for opening day, and it’s nice to see the completion of your goal. good pitch Ben. I’ve enjoyed following your blog this entire season and may you continue to be healthy and live your life to the fullest. God Bless!